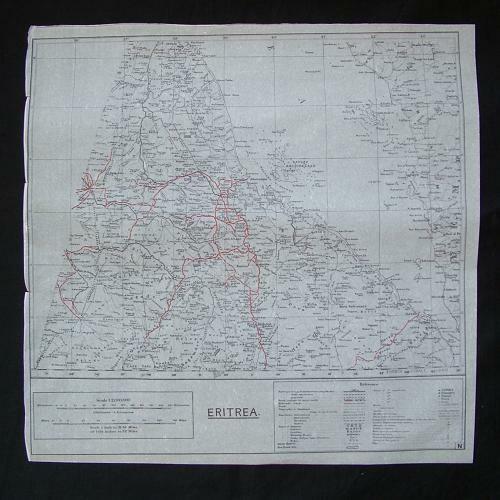 Sheet 'N', Eritrea. Approximately 46 x 46cm. Scale 1 : 2,000,000. Printed in black ink with major roads marked in red. Rare tissue paper escape and evasion map. These were the brainchild of Clayton Hutton at MI9. He wanted a map that was strong, silent to use, lightweight and easy to conceal. By using wood pulp from the Mulberry tree this goal was acheived and the resulting maps are incredibly thin and light. They could be screwed up almost silently, soaked in water and yet still used. Due to the lack of bulk they could also be concealed in much smaller spaces than the equivalent silk map. This example is in excellent condition, unfolded and largely crease free aside from minor edge tears and folded corners. Stock code E22135.